Trump’s Syria Exit Provokes Washington Panic – Stop the Wars at Home and Abroad! The former commander of American-led troops in Afghanistan from 2009 to 2010, General Stanley McChrystal, warned that “Trump’s approach to national security was reckless.” Eight years earlier, the same McChrystal, working under the Obama administration, pilloried then Vice President Joseph Biden for publicly revealing that Turkey, Saudi Arabia, the United Arab Emirates, Qatar, and other Gulf State monarchies had systematically provided weapons to and trained al-Qaida and other terrorist groups to invade Syria for the purpose of removing the Bashar Assad government. Biden apologized for his “indiscreet” statements but never repudiated their validity. The warmongering Democrats joined their Republican counterparts along with a host of generals, past and present, to signal Trump that in the United States presidents really don’t make fundamental policy. This remains the exclusive prerogative of the capitalist multi-billionaire ruling-class elite, who own and control the nation’s wealth, resources, dominate the government’s central institutions, and engineer major policy decisions through their secret and private channels. “Some analysts said they believed Mr. Trump’s orders would not even be carried out—at least not on the 30-day timetable he imposed for Syria. The Pentagon has slow-walked his orders before, and already there is talk of a more gradual withdrawal given the complications that would probably arise from a hasty pullout” [emphasis added]. In truth, Trump has no intention of ending the U.S. war against Syria, an imperialist slaughter that has taken the lives of some 350,000 to 500,000 Syrians and led to the tragic exodus of almost half the population. Trump stated as much during his Iran visit in late December, when he reported that the 2000 U.S. Special Forces troops—trained killers—would be moved across the border to neighboring Iraq. He implied that the nearby U.S. base in Qatar would be on the ready to bomb Syria at his command, as it has innumerable times over the past years. He made no mention of the thousands of additional U.S. forces stationed on the U.S. flotilla offshore Syria in the Mediterranean Sea. Nevertheless, the hoopla over Trump’s announcement has revealed some truths that have usually been denied by all previous U.S. administrations as well as by significant portions of the U.S. left. Denials aside, for example, Joseph Biden’s original statement that the Gulf State monarchies have been systematically arming, training, and directing al-Qaida and related terrorist groups to overthrow the Assad government has been fully confirmed today. Further, no one denies that the so-called Free Syrian Army, previously touted as representing “moderate rebels,” is or has ever been anything other than the creation of the U.S./NATO and Turkey. In the same vein, the so-called remaining al-Qaida/Nusra Front/Free Syrian Army imperialist “coalition” armed fighters in the northern province of Idlib, 30,000 or more, are the same U.S./NATO/Gulf State monarchy-financed and directed forces who exist today only at the discretion of and under the protection of U.S. imperialism. When Syrian Army troops in early October made some initial moves to re-take, or better, liberate Idlib from its imperialist-backed occupiers, they were warned by the top UN diplomats from the U.S., France, and Britain that the full force of world imperialism would be launched against them. “How dare the Syrians invade the land they were born in” was the united refrain of the world’s superpowers! Again echoing the real positions of the U.S. ruling class, The Times and its quoted sources repeat ad nauseam that a U.S. withdrawal would “cede the eastern part of the country to the Syrian government and its Russian and Iranian allies.” Imagine that! The Syrian government would regain the 30 percent of Syria now controlled by U.S. imperialism! And what would the Syrian government do with this regained region? All sources have concluded that the Syrians would use this oil rich and fertile land to rebuild, with Russian and Iranian assistance, their devastated nation! We should note here that over the past years when ISIS controlled the same oil resources, the complicit U.S. military consciously ignored the endless ISIS truck caravans that openly transported Syria’s stolen oil to Turkey, where it was sold to finance ISIS operations. Today, the imperialist-promoted myth of an ongoing popular democratic insurgency against the Syrian government has been abandoned by virtually everyone. Yet, as in Vietnam, “knee deep in the big muddy, the big fool presses on.” This is not the first time when ruling-class divisions over imperialist war policy have been brought to public attention. With regard to Nicaragua, Cuba, Vietnam and elsewhere, debates over whether to bomb the nation in question “back to the stone age,” or to consider other options like imposing U.S. imperialist will by more subtle means, including behind the scenes negotiations, have always been on the table. In Afghanistan, for example, U.S. troop withdrawals have been accompanied by the sending of the largest privatized army in U.S. history—50,000 troops—to accomplish the same imperialist ends. In Nicaragua, it was the U.S.-organized and funded Contras, operating out of Honduras; in Cuba it was a U.S.-trained army in the Dominican Republic that invaded Cuba at the Bay of Pigs in 1961. The blustering bully warmaker Donald Trump, whose military budget exceeds all others in world history, and who is fully is aware that U.S. death squads, sanctions, drone wars, embargo wars, and never-ending real wars wreak death and destruction across the globe, was stupid enough to believe, for a moment at least, that he could tweet U.S. war policy on his own authority. No doubt he has now been convinced otherwise. “American-backed Kurdish People’s Protection Units, or Y.P.G., said the Syrian government, should send troops to the city of Manbij, near the Turkish border. To the horror of U.S. officials, the Y.P.G. invited President Assad to visit areas under their control and to discuss a resolution of Kurdish demands for a form of federated participation in Syria wherein Kurdish majority regions would be granted greater autonomy and local control. This was not the first time that Kurds have called on the Syrian government for aid against Turkish onslaughts in areas in the northern border regions where Kurds predominate. In the recent past, whenever the joint forces of the Syrian Army and the Kurdish militias approached areas to defend Kurds who were under siege by Turkish forces, the U.S. backed the Turkish slaughter. U.S. forces have been repeatedly deployed against the Syrian Army when it sought to re-take regions held by ISIS in the northeast and by other U.S.-backed terrorist forces. Today, the Zionist colonial, settler state of Israel, backed to the hilt by the U.S., has, according to the Dec. 26 New York Times, “made clear it will not tolerate an increased threat from Syria, which the Israelis demonstrated on Tuesday [Dec. 25] with airstrikes near Damascus.” Israel too, with U.S. support, occupies a portion of Syria that it conquered in the Golan Heights region in the 1967 war. Israel’s periodic and numerous bombing attacks on Syria in support of various terrorist forces have been painfully ignored by the Syrian government to avoid providing a pretext for a full-scale Israeli attack. It also revealed that despite the abject failure of overall U.S. war policy in Syria, and its not too dissimilar failures in Afghanistan over the past 18 years, the imperialist beast presses on with impunity and with a cynicism stemming from a belief that there are still “benefits” to be gained, whether in the form of countless billions in profits to be registered by the military-industrial complex or in the cynical supposition that “victory” can or will eventually be achieved by reducing Syria to ashes and demoralizing its government to the point that it will, in time, accept virtually any settlement offered by its would-be conquerors. Such are the exigencies of the U.S. warmakers. In the U.S., challenging the U.S. war machine in Syria and the world over requires the construction of an independent, massive and united antiwar movement capable of mobilizing hundreds of thousands and more in the streets to unequivocally demand: U.S. Out Now! Self-determination for Syria and all oppressed peoples and nations! No to all U.S. wars at home and abroad! 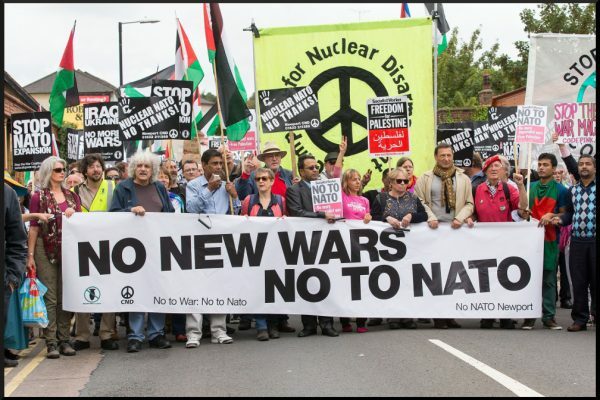 The nationwide antiwar protests initiated by the United National Antiwar Coalition (UNAC) and joined by hundreds of antiwar and social justice organizations for a March 30 march and rally in Washington, D.C., and other cities is an excellent starting point. Contact UNAC at: moc.l1555960324iamg@1555960324ecaep1555960324canu1555960324.